DKE07: Luxus Bridgekort. Ca.1930. Prce: € 30.00. Printed in England. Design by Barbara McDonald. Very worn and dirty cards. 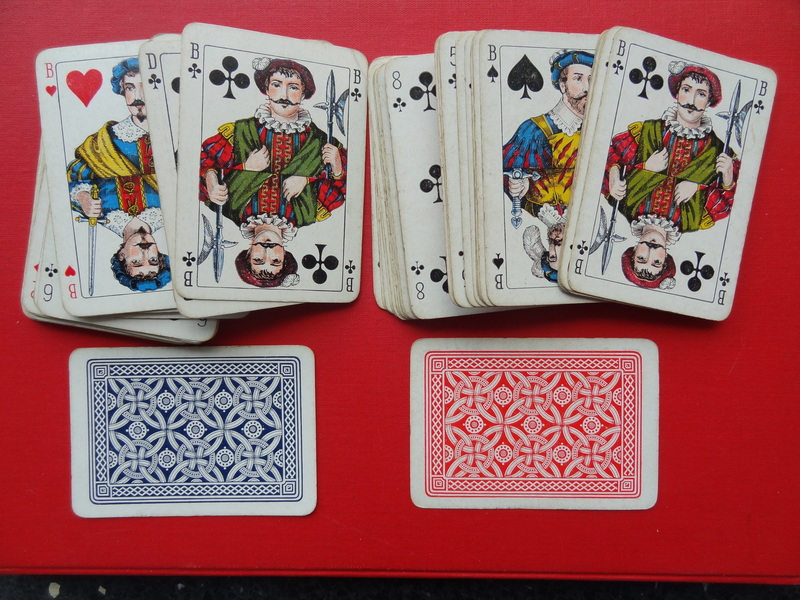 Missing: Joker, Jack of Hearts and Jack of Diamonds. Really a ridiculous price for the deck, but it is extremely rare. I have only seen it EXPENSIVE on auction once, and EXPENSIVE for sale twice within the last 20 years. + 1 much worn Jack of Diamonds with red back. DKE08: Luxus Bridgekort. Ca.1930. Price: € 6.00. Printed in England. Design by Barbara McDonald. Very worn and dirty cards. 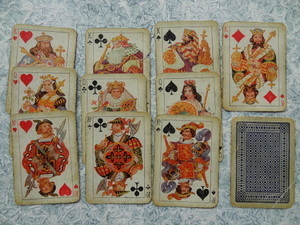 ONLY THE 8 SHOWN CARDS. Rare. DKE38: Warburgs Bridge Kort. [No.1]. Price: € 20.00. Printed in England. F rom the 30s. 52 cards, used. The box is torn along the edges. DKE48a: Warburgs L’Hombre-kort. No.9. Price: € 35.00. Printed in England. Late 30s. SLigthly used. Complete, in sligthly worn box. DK48b: Price: € 6.00. Used, with smudges and breaks. Jack of Clubs is missing. No box. DKE50: Whist. Price: € 3.00. Worn, dirty and smudged cards, 52, with breaks and bends, worn box. DKE59: Blue and Red. Ca.1926. Price: € 6.00. Two decks. INCOMPLETE. The blue deck misses the King of Diamonds. The red deck misses the nine and Ace of Hearts, 9-10 of Clubs. Worn/dirty cards. No box. DKE59a: Blue. Price: € 2.00. 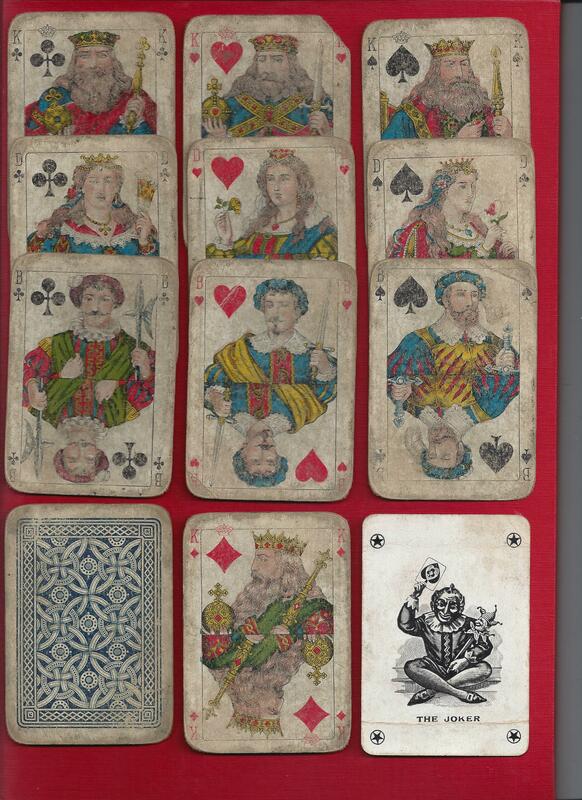 This deck is shamefully dirty – but also documenting, that in earlier times playing cards were not just discarded, even when heavily used. With joker, and blank.